We take safety seriously. It’s one of our top priorities. Follow us on Facebook and Twitter for updated information during an outage. To report a power outage, broken line or broken power pole, call 253-502-8602. Please call only once to keep the line open for other customers. We also ask for your patience. Many people can be affected by a storm or outage, and our phone lines may be busy. 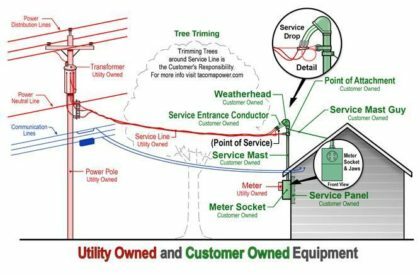 Any visible damage or specific problem, such as a tree in a power line, a wire down, an audible explosion, a broken pole, etc. When you call, we probably won’t be able to tell you how long the power outage will last. The length of the outage depends on the extent of the damage and the kind of repairs that we have to make. 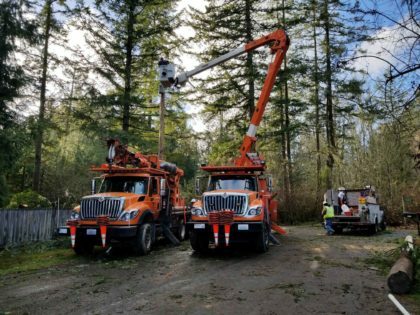 Work may be hampered by bad weather or darkness, but crews will work around the clock until your electricity is restored. Restoring power after an outage is a complex job. The goal is to restore power safely to the greatest number of people in the shortest time possible. Priorities vary depending on the situation. Learn more about how we restore power. Communications lines are the lowest lines on a power pole. They are thinner than power lines, which hang above. This diagram shows all the different lines running from the street to your home. Power outages become more likely during fall and winter. Although Tacoma Power has a very reliable system, it’s a good idea to prepare for a power outage just in case it happens. Keep our outage number handy: 253-502-8602. Learn how to manually operate your automatic garage door. If you use electricity for water, such as a well with an electric pump, have enough water available to last a couple of days. You should have at least a gallon of drinking water a day for each person in your house for drinking and cooking. If you or someone in your household depends on electricity for life support, please call us at 253-502-8600 before an emergency. We will note your account, and your home will be a priority during outages. Do not use a natural gas range to heat your home. Don’t burn charcoal for heat or cooking indoors. Both fuels give off dangerous fumes. If you use a kerosene or propane space heater, open a window for ventilation. Otherwise, there is a real danger of death from carbon monoxide poisoning. Use flashlights, not candles. Candles may start a fire. Never plug portable or auxiliary generators in to a wall outlet. Learn more about generator safety.